You own a vegetarian, vegan or VEG-friendly restaurant? Let's work together then! Vegman.org is a service that allows users to search for veggie restaurants worldwide. At the moment, this can be done by using our website or by downloading the iOS APP. Our platform is not only beneficial for users, it is a great opportunity for restaurants to reach more veggies as well. And we are adding new features every week. If you are not sure if your restaurant is already listed on Vegman.org (and inside the Vegman app) please search for it by entering its address or name into the search field. If your restaurant does not show up, you can suggest it. To do that you need to sign up and log in. In the lower right corner you will find the KarmaDock. Click the "Suggest a restaurant" button and follow the form. If you you want to change content on your restaurants page, you can do so by using the "flag wrong content" feature. 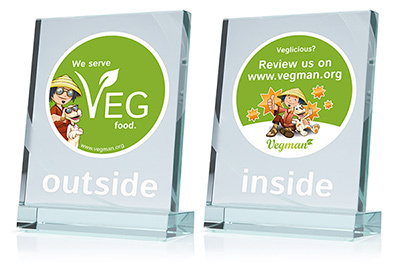 The Vegman door sticker is a very effective tool for directing potential customers to recommendations from other people. It is already in use by many restaurants, drawing attention to the positive experiences made by previous visitors, as well as communicating the message, "We are on Vegman! " and "We care about your opinion!". Please use our contact form to order your FREE Vegman sticker.